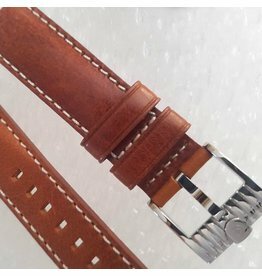 Note: Make a choice of leather strap, NATO, bracelet using the drop-down box! The Dual Time models that were released by Magrette a while back, have always been very popular. The blue dial is made of two discs on top of each other with cut-outs for the indices and date, often referred to as a "sandwich-dial". Super Luminova (BGW9) will ensure visibility in dark conditions. As further difference with the first edition of Dual Time models, it now has a display case back that shows the Swiss STP 1-11 automatic movement with customized rotor. It now has a WR rating of 500 meters. A further change is the availability of a steel bracelet as option. It makes the whole watch look completely different we think! The standard package is watch + blue croc pattern leather + NATO in the Magrette travel case. Different color straps and bracelet can be selected using the drop down box. Bezel: Internal bi-directional bezel to set 2nd time zone. Buckle: Stainless steel with logo, steel bracelet has a closure with micro-adjustments.